Apart from a chilled glass of wine there’s nothing more deliciously refreshing in the middle of summer than juicy, fresh-off-the-tree stone fruit and to me it seems the stone fruit is more abundant this year. Perhaps it is because for the last few weeks the fruit has been prolific at the farmers markets I’ve been to, and the produce stores have created tempting displays right by the entrance to woo you not only with the sight of these glorious beauties but also the smell. Inhale deeply and swoon. Mmmm-mmm. Some days there are even yummy samples of the most pristine fruit to taste and yes, you know you just have to buy. This year the nectarines year have been especially scrumptious, the last of the juices dripping down my chin to be wiped off with the back off my hand and then the aftertaste lingering in the mouth for ages. And that aftertaste of nectarine is exactly what I found in Richmond Plains Nelson Blanc de Noir 2016. Blanc de noir means white of red, and this Richmond Plains wine made from pinot noir definitely looks like white in the glass. Served chilled, as you have to, the taste is crisp and steely with that whisper of nectarine most definitely – try it after you have eaten a nectarine and you will see. And then there’s a slightly musky grapey taste as the wine flavours linger persistently. 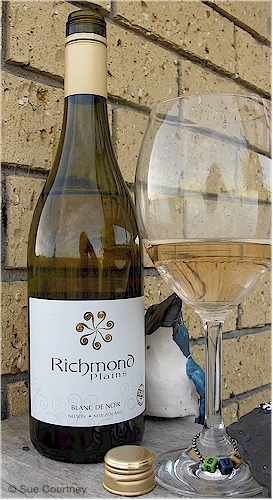 Richmond Plains Blanc de Noir 2016 accompanied with the lingering taste of a just eaten nectarine was for me the most pleasurable and delightful summer evening aperitif. So about the wine. It’s made from 100% Nelson pinot noir grapes that are certified organic and biodynamic and is marketed as being suitable for vegans. I love the winery’s description of the colour as ‘pink diamond’ – the most delicate flicker of pink there to see at certain angles. It has 12.5% alcohol by volume and costs $22.90 a bottle. Find out where to buy from richmondplains.co.nz. This entry was posted in #nzwine, nelson, NZ regions, rose, white wine and tagged 2016, biodynamic, Blanc de Noir, organic, Richmond Plains, vegan by Sue Courtney. Bookmark the permalink.